Eternal Haunted Summer: If you could correct one common misconception about ancient Greek mythology/spirituality/religion, what would it be? Nina Kossman: I’m not sure there is a misconception. Those who know and love Greek mythology usually never stop loving it and often see it as reflecting, or leading to, their own spirituality, by which I don’t quite mean trying to revive the old gods, but seeing them as forces that personify our subconscious. Maybe because the myths echo the structure of our subconscious, every new generation of poets (as well as those lucky mortals who are not poets) finds them an inexhaustible source of inspiration and self-recognition. There is a direct link between tradition in the classical sense and that shelter which the ancient gods never left: our subconscious. NK: I don’t call my aspirations spiritual or a path, but if I were to define them, I would say that for me spirituality, or whatever we mean by it, is inseparable from creativity which is a mirror that helps me not just to see myself but also to know who I am and where I am going at any given time — going or standing still, as this too will be reflected in the mirror. 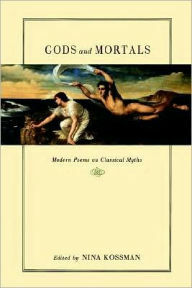 EHS: Several years ago, you compiled and edited Gods and Mortals: Modern Poems on Classical Myths. Firstly, why that subject? Why modern poems and why classical myths? EHS: How did you go about selecting the poems for the anthology? Were there some poems you absolutely knew you were going to include? NK: The basis for the selection was that a poem be a provocative or unusual treatment of a particular myth. I included poems by internationally celebrated poets such as Akhmatova, Auden, Cavafy, H.D., Lawrence, Mandelstam, Rilke, Seferis, Valery, Yeats, and Walcott, as well as many by lesser-known poets. Some of the poets, such as Hans Magnus Enzensberger, Max Jacob, and Marina Tsvetaeva, are known in their own countries, but relatively unknown here. EHS: Did you make any surprising and wonderful discoveries while reading possible selections for Gods and Mortals? NK: After a while, I began to see certain patterns in poets’ thinking about gods and heroes, even in poems (and poets) who were worlds apart. For example, the tradition of donning a Greek mask is often used by poets in order to speak of things they have found difficult to approach otherwise. One of these poets, H.D. (Hilda Doolittle), holds the mask so close that at times it is hard to distinguish her own features behind it; the poet become the mask. On the other hand, Marina Tsvetaeva, a contemporary of H.D., remains absolutely herself, whether she speaks as Eurydice or the sibyl. By endowing the mythical personae with her own intensity, Tsvetaeva gives us the most impassioned Greek heroines in modern poetry. Other poets observe their mythic protagonists instead of fusing with them. Barbara Bentley, a Welsh poet, is a case in point. In “Living Next to Leda” she becomes an eyewitness to the events of Leda’s life. These are just a few examples of the patterns I discovered while working on this anthology. EHS: Some of the poets included in Gods and Mortals did not produce the original work in English. Was translation ever a factor in the selection process? NK: I translate poetry myself, therefore I found it interesting to translate a number of Russian poems for this anthology. I translated four poems by Marina Tsvetaeva, five poems by Osip Mandelstam, one by Anna Akhmatova, three by Yunna Morits, one by Boris Filipoff, and one by Leonid Bulanov. I am much more interested in poetry from other cultures than in contemporary American poetry, so it was natural for me to seek out translations. I commissioned several translations of Rilke, and I searched for and found translators of poems from Romanian, Greek, French, Lithuanian, Bengali, even Chinese. EHS: You are also an accomplished and critically-acclaimed poet in your own right, publishing in both English and Russian. Do the poems come to you in one language or the other? Have you found either language to be better at expressing a particular emotion or thought or theme? NK: I’m bilingual, so theoretically it should make no difference, as I ought to be able to write poems in either language — and I do. The problem is that writing a poem in Russian is very different from writing one in English, not only because Russian poetry demands more skill (formal, even metrical, poetry is still very much alive in Russian), but also because writing, as well as reading, poetry is still somewhat of a national pastime, certainly much more so than in this country; you can’t just write a piece of what is essentially prose, break it into short lines and call it a poem — expectations are quite high, and even a non-poet’s knowledge of classical as well as contemporary poetry is quite broad and deep. In order to write a poem, I think the language has to be alive in your subconscious, and while Russian is my native language, it is the language of my past. All I’m trying to say is that, while I continue to write in both English and Russian, writing in two languages is a bit of an acrobatic mental act which takes place in the circus of the mind. EHS: You are also an artist, working with paint, bronze, plaster of paris, and even roots. Many of your paintings feature Gods and Goddesses and scenes from mythology and fairy tales. Firstly, how do you decide what to paint? Are you inspired, or do you set out with a clear idea of what you want to do? NK: I’m usually guided by inspiration, even if I do have a pretty good idea of what I want to do. At some point, my dwelling on the nature of inspiration prompted me to start thinking about Greek gods. What is inspiration? Where does it come from? The ancient Greeks left us fascinating answers to these questions embodied in Dionysus, Apollo, Orpheus, the muses … Take your pick. Mythic protagonists often appear in my paintings for the same reason as fairytale creatures — both personify the forces of inspiration and the unconscious. EHS: Are there mediums you would like to use in the future, but have not yet? NK: I think that at this point in my life I have tried all the mediums I have ever been interested in. I would like to work with bronze more often: I’ve done only three bronzes, but I think they were pretty good, and I’ve enjoyed working on them, so that’s one thing I’d like to do more of but can’t, simply because casting in bronze is prohibitively expensive. NK: I’m working on several large projects and several small ones. I paint and make root sculptures almost every day. 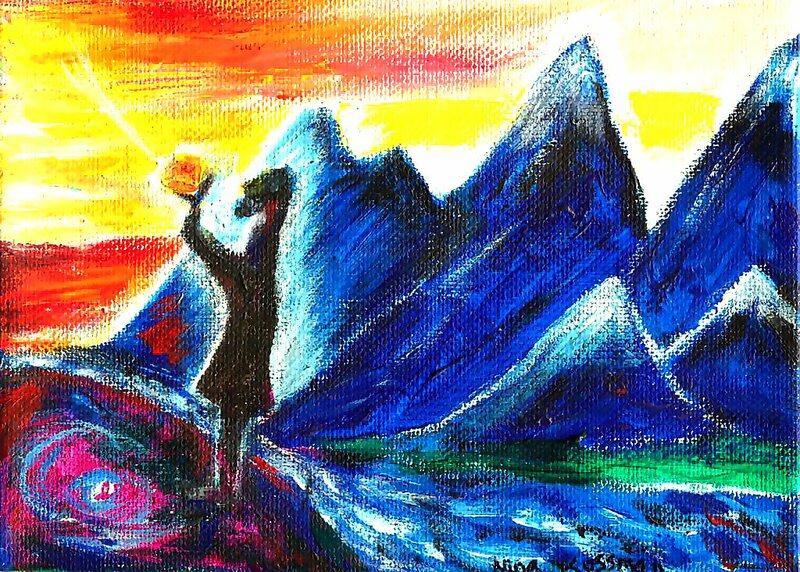 One ongoing project is combining a poem with a painting, i.e., writing a poem and making a painting that goes with the poem. This is something I love doing more than anything else. EHS: Which book fairs, art fairs, conventions, or other events will you be attending in the foreseeable future? NK: I don’t usually go to book fairs and conventions. I’d rather use the time to work on my projects.